It all started just like any other morning, except I was holding a pineapple and the cove was covered in ten thousand dead jellyfish. Caitlin is the only young person living on Middle Island. On the first day of vacation, she finds a tiny alien on the beach. 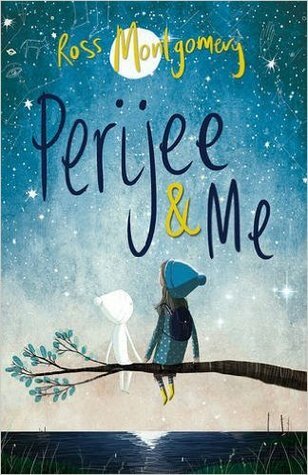 Caitlin becomes close to her secret friend, whom she names Perijee, teaching him everything about her world and treating him like a brother. There’s only one problem: Perijee won’t stop growing. And growing . . . Caitlin will have to convince the adults around her—and Perijee himself—that the creature they see as a terrifying monster is anything but. I have so much love for this book! As the storm sweeps in, you are quickly caught up in the emotional whirlwind of the story. The characters melt your heart while at the same time, tickling you under the ribs. Caitlin is utterly adorable and yet you feel sorry for her. Her yearning for a friend to call her own breaks your heart. Her unlikely friendship with Frank, is beautiful. He quickly becomes the fatherly figure, her life lacks. When she discovers Perijee, their ties of friendship are instantaneous. If you learn one thing from this book, it is that strong friendships can stand up against anything. The humour is unstoppable at times. I read the book while in company and everyone kept giving me funny looks at I tried so hard not to laugh out loud. This story has a twist at the end, which I honestly didn't see coming. All I can say is, you will be surprised and shocked. The Middle Grade brigade are going to love this book. The kids will easily relate to the humour and wild imagination of the author. If Steven Spielberg and Roald Dahl had ever collaborated on a story, this would be it.